Houghton Mifflin Harcourt, 9780544363779, 304pp. 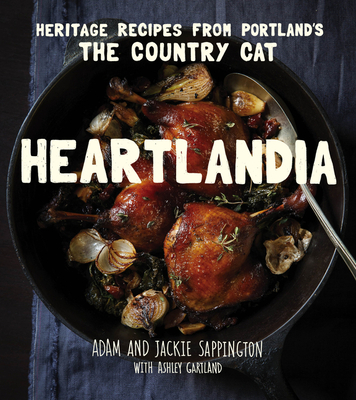 Heartlandia is based on husband-and-wife team Adam and Jackie Sappington’s acclaimed Portland restaurant, The Country Cat Dinner House & Bar. Adam, Executive Chef and a self-taught expert in whole animal butchery, and Jackie, the Executive Pastry Chef, make food that is the definition of soulful, heartwarming comfort food. Some of the mouthwatering dishes include Autumn Squash Soup with Apple Cider and Brown Butter, Red Wine-Braised Beef with Wild Mushroom Steak Sauce, and Crispy Fried Oysters with Smoky Bacon and Green Apple Ragout. And don’t forget about their legendary Skillet-Fried Chicken. The sweets are just as enticing, such as the Challah French Toast with Maker’s Mark Custard and Clabber Cream, Butterscotch Pudding, and Bourbon Peach Crumble Pie. Additional chapters include one for drinks and another for pickles and preserves. The cookbook also has beautiful photographs that capture not only the amazing food but also the spirit of the restaurant and the heartland. Always comforted by food’s ability to incite conversation and generate close-knit bonds, ADAM SAPPINGTON is the Executive Chef at The Country Cat, the premier made-from-scratch, farm-to-table restaurant located in Southeast Portland. Beginning in a cutting-edge trattoria in his hometown, Adam attended the Western Culinary Institute in Portland and soon landed at Wildwood Restaurant, where he worked his way up to Executive Chef over the course of 11 years. A self-described “pie geek,” JACKIE SAPPINGTON started experimenting with food at an early age, tackling her first recipe at just 10 years old. In 1995 she moved to Portland, where she worked her way through Wildwood and Paley’s Place. She switched gears to pastry at Café Azul and Lauro Kitchen. With a sole focus on pastries for more than 10 years now, Jackie’s approach is warm and patient, but meticulous and infused with love. "Missouri heritage cooking meets the clean flavors of the Pacific Northwest in this improbably delicious mash-up...With generosity and a warm sense of humor, the Sappingtons invite everyone to pull up a chair at their family table—and with recipes like theirs, readers will be more than happy to dig in."